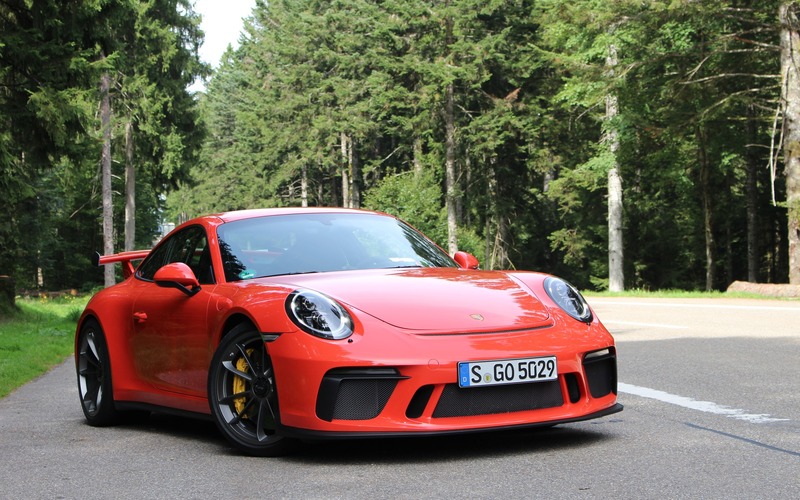 STUTTGART, Germany – Driving the GT3 on public roads, even the fantastic countryside roads that slither through the forests surrounding Stuttgart, feels like a waste. This car belongs on a track. Actually, the GT3 is super civilised on this type of roads, but driving at the posted speed limit is torture. This thing begs to be pushed to its performance thresholds, which are much higher than my own. Around town, though, on cracked and potholed pavement, consider the GT3’s ride to be another kind of torture. 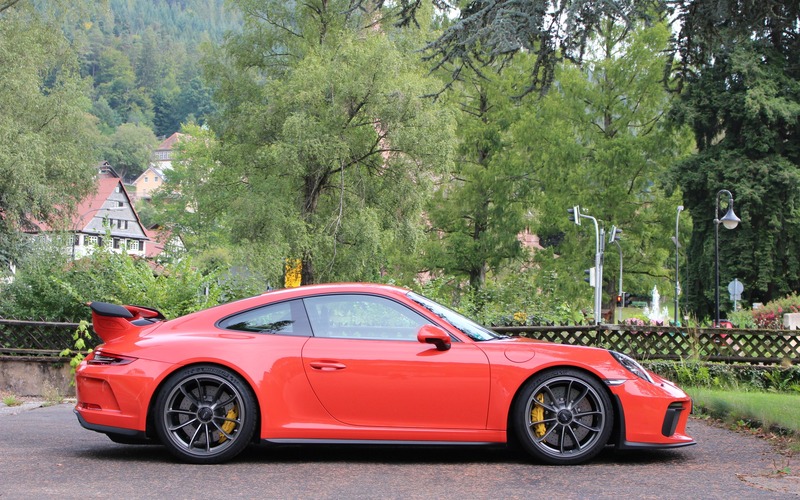 The 2018 Porsche 911 GT3 is one of the beastliest variants of the German’s brand’s model line, second only to the mighty 911 GT2 RS street-legal race car, which costs twice as much. The GT3 is also the only one without a turbocharged engine, which means a raw, unmuffled soundtrack that can send shivers down any living and breathing human being’s spine. It’s a dry-sump, 4.0-litre six-cylinder engine that can scream up to its 9000-rpm redline, producing a cavalry of 500 horsepower and 339 pound-feet of torque. An engine developed to be winded up and down all the time, unlike the twin-turbo flat-sixes of the current 911 line-up, which are rich with low-end torque. To fully exploit this engine, the GT3 can be equipped with a six-speed manual transmission or a seven-speed dual-clutch PDK gearbox. Our test car was equipped with the latter, and it’s excellent, with rapid-fire gear changes summoned by the wheel-mounted paddle shifters. Seriously, find a long and narrow tunnel, make sure there’s no traffic ahead, press the sport exhaust and PDK Sport buttons, downshift and nail the throttle. The GT3’s shriek turns into a sensory overload. Repeat as necessary, as long as you do it safely and legally, of course. Sure, the car isn’t as quick off the line as a 580-hp 911 Turbo S, or even a 540-hp 911 Turbo for that matter. However, it’s lighter by 400 lbs. (182 kg) thanks to revolutionary weight-saving techniques such as dumping out the rear seats and the front-wheel drivetrain (the GT3 is RWD), but also the use of polyurethane with hollow glass microspheres and carbon-fibre components for the car’s bodywork. With the PDK and the launch control system activated, the 2018 Porsche 911 GT3 can blast from zero to 100 km/h in 3.4 seconds. With the manual gearbox, a similar sprint takes 3.9 seconds, proving that a dual-clutch setup is quicker than human intervention. In comparison, the 911 Turbo S can reach 100 km/h in 2.9 seconds. The GT3 is $20K than the Turbo, and more than $50,000 than the Turbo S.
The car’s handling is just amazing, although we weren’t expecting any less of it. The steering is surgically precise, the suspension is firm with almost no body roll, and the various scoops and vents on the body not only help cool down the mechanical components, but also increase downforce so the car sticks to the pavement like a fly on, well, flypaper. For cruising city boulevards in search of admiration and self-confidence, the GT3 is punishing, but there are admittedly worse choices out there. The exhaust can stay pretty quiet at low engine revs, and the automatic gearbox’s shifts aren’t too jerky at slow speeds. It’s still a very raw car, though. The 2018 Porsche 911 GT3’s cabin isn’t too luxurious, but the basic stuff is present and accounted for. There’s contrast stitching on the dashboard, while Alcantara covers the steering wheel as well as—optionally—the door panels and lower section of the dash. Sport seats with minimal adjustments are standard, but can be ditched for optional 18-way power-adjustable seats or—found in our test car—carbon-fibre racing seats. It’s really not hard to spot a GT3. It’s lower to the ground than other 911s, it boasts a wide air vent on the front bumper that hugs the trunkline, exclusive alloy wheels and, of course, there’s that huge fixed wing that blocks the view out the rear window. Come to think of it, it will be tough to see a GT3 on the road because there are so few of them sent to Canada. Pricing starts at $163,300 before options as well as freight and delivery charges. The car you see in these pictures retails for close to $200K. However, that’s a small price to pay for a rare and magnificent beast that will make any 911 connoisseur pee their pants as the car passes them by. Promise us one thing: if you do get your hands on one, please don’t waste its performance potential and take it to a track where it really belongs. 4/10	We expect it to be pretty bad, because we’d be really stupid to eco-drive this car. 5/10	Not as brutal as it would seem, although in the city, the ride will be punishing. 9/10	A half-second slower than a 911 Turbo S. But that sound as the engine spins to its redline is magic. 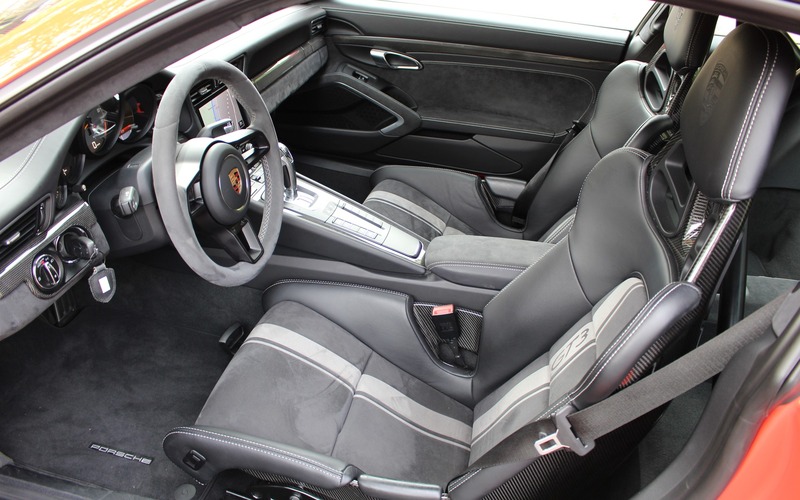 7/10	Porsche’s standard system, with a fairly reactive touchscreen and basic set of features. Audiophiles should spring for the optional Bose stereo. 10/10	Spectacular handling, raw and spine-tingling drive. 9/10	Half street car, half race car, fully mental. Its name is fitting, as only 500 units of the Porsche 911 Turbo S Exclusive Series will be produced and sold worldwide. In addition to 27 extra horsepower over the 911 Turbo S, for a total of 607, this rare beast gets an exclusive design, higher-quality materials and sumptuous detailing.